When you need a wide range of horizontal LCD movement, this monitor arm fits the bill. 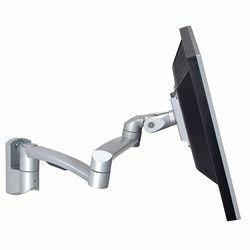 With three pivot points and a reach of nearly 2 feet, it can be used to move a monitor around multiple workstations. The arm bolts to the wall and can hold a monitor up to 30 lbs. in weight with either 75mm or 100mm square VESA mounting. Includes mounting hardware. Assembly required. Monitor not included.